Beginning in the late 1990s, Serena Williams became one of the world's most talented and exciting tennis players. With her outgoing personality, unique fashion sense, and striking good looks, Williams would have commanded attention even if she hadn't been a topranked professional player. But her skills on the court happen to be extraordinary, the result of years of training, natural ability, and a powerful determination to win. Williams has gained additional attention as an African American athlete in a sport generally dominated by white players. Her 1999 singles victory at the U.S. Open made her only the second black woman ever to win a Grand Slam title; Althea Gibson (1927–2003) was the first. The Grand Slam tournaments—the Australian Open, Roland Garros (better known as the French Open), Wimbledon, and the U.S. Open—are among the game's most visible and significant events for pros. By Williams's side—and often across the net—has been her older sister, Venus, an equally commanding player. Both sisters spent several years at the top of the world tennis rankings, each reaching the number-one position in 2002. As of the summer of 2004, Serena Williams had won six singles titles in Grand Slam events as well as numerous doubles titles, including a gold medal at the 2000 Olympic Games in Sydney, Australia. An ambitious, multitalented person, Williams has also, since 2002, explored acting, appearing in several television episodes and pursuing film roles as well. In addition, she has, along with her sister, studied fashion design. "Just watching her is inspiring. I just want her to have it all. To be honest, I want more for her than I do for myself." Venus Williams, People magazine, June 28, 2004. The youngest of five daughters born to Richard and Oracene (who goes by the nickname Brandy), Serena and the rest of the Williams family moved from her birthplace of Saginaw, Michigan, to Compton, a suburb of Los Angeles, California, when she was a baby. An economically depressed area, Compton is a rough, often violent neighborhood, and the Williams sisters occasionally witnessed exchanges of gunfire. An avid fan of tennis, Richard Williams envisioned his daughters as champions even before they were born. He bought books and instructional videotapes, teaching himself and his wife how to play tennis so they could then teach their daughters. Both Serena and Venus showed promise at a very early age, prompting their outspoken father to begin making predictions about their future success in the tennis world. Coached by her father, Serena entered her first tennis tournament at age four and a half, and her father recalls that, over the next five years, she won forty-six of the next forty-nine tournaments she entered. She and Venus both excelled in the highly competitive preteen circuit in Southern California, both attaining a number-one ranking in their respective age groups. Before reaching their teen years, the sisters had begun attracting attention far beyond the borders of their home state. They received offers for endorsement deals from sporting-goods companies and invitations to prestigious tennis camps. In 1991 Richard Williams withdrew the girls from junior tournaments, a decision that was widely criticized by tennis insiders. The junior circuit is accepted as the conventional path to tennis stardom, but Richard wanted to protect his daughters from the intense competition and from what he perceived as racial hostility from other players. Richard invited teaching pro Rick Macci—who had earlier coached such tennis stars as Mary Pierce and Jennifer Capriati—to come to Compton and watch his daughters play tennis. Macci came, and he was impressed by the sisters' skill and athleticism. He invited them to study with him at his Florida academy, and soon after, the family relocated to the Sunshine State. The proceeds from a clothing endorsement contract for Serena and Venus allowed the family to purchase a home in Palm Beach Gardens, not far from the tennis school. By 1993 the girls had left school, opting to continue their education at home and spend as much time as possible honing their tennis skills. Later they both returned to a school setting, enrolling at a small, private school called Driftwood Academy. Williams graduated from high school in 1999. In 1995, at age fourteen, Williams turned pro, arousing controversy among many who felt athletes should be older before they become professionals. The Women's Tennis Association (WTA), the governing body of women's professional tennis, barred competitors from WTA events at that age, so Williams's first pro event was a non-WTA tournament in Quebec, Canada. She was quickly eliminated from that competition. Her introduction to professional play indicated that she needed additional training time, and Richard decided that his youngest daughter should take a break from competition for the remainder of that year and the following year as well. Williams began 1997, her first year as a WTA competitor, in the shadow of her sister, who had shown herself to be a promising young player. The Ameritech Cup in Chicago, however, made it clear that Serena Williams was more than just the little sister of Venus: she was a budding star in her own right. At that tournament, she shocked observers by defeating Mary Pierce, then ranked seventh in the world among women players, in the second round. Further defying expectations, Williams went on to defeat fourth-ranked Monica Seles in the quarterfinals before losing to Lindsay Davenport in the semifinals. She completed the 1997 season ranked ninety-nine, an impressive debut year for a sixteen-year-old player. She continued to build her skills and confidence in 1998, beating a number of players ranked far above her. One such victory—beating ninth-ranked Irina Spirlea in the first round of the Australian Open—led her to a matchup against her sister in the next round. Venus won that match, a victory that aroused complex emotions for both sisters. Venus, accustomed to her role as big sister, wanted to take care of and protect her sister. Serena had spent most of her life looking up to Venus and working to be just like her. Both sisters, however, also felt an intense drive to win, regardless of who is on the other side of the net. The Williams sisters have since met many times as opponents. Some observers have suggested that they lack their usual passion when they play each other, a charge both have denied. Such matchups do result in mixed feelings, however, with the victor feeling both triumphant and regretful. Serena and Venus are best friends, but they are also intensely competitive with each other, and each sister uses the other's success as motivation to improve. In a 1998 article, Serena told Sports Illustrated for Kids, "I've learned a lot from watching Venus. Her results have encouraged me to work harder so that I can do well, too." The Williams sisters have also played together many times as a doubles team, with 1998 marking the first time the sisters won a professional match together. Serena also won two Grand Slam mixed doubles titles that year—at Wimbledon and the U.S. Open—with partner Max Mirnyi. 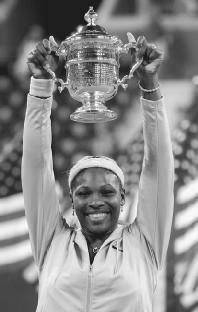 While she had yet to win a major singles title, Williams earned more than $2 million dollars during 1998. The following year proved even more successful, with Williams winning a number of events. Her first singles title of the year was at the Paris Indoors tournament; Venus won a tournament the same day in Oklahoma City, Oklahoma, marking the first time in the history of professional tennis that two sisters won championships on the same day—or even in the same week. The professional highlight of the year came when Williams defeated three of the top-four tennis players in the world to win the singles title at the U.S. Open. It was her first singles victory at a Grand Slam event, and the first time in more than forty years—since Althea Gibson's win in 1958—that an African American woman won a Grand Slam singles title. Another 1999 milestone was Williams's first professional victory over her sister, beating Venus in the Grand Slam Cup. The two teamed up to win two Grand Slam doubles events that year, at the French Open and the U.S. Open. Williams finished the 1999 season as the fourth-ranked women's player in the world. The following two years proved difficult for Williams, with a series of injuries resulting in a number of losses and forcing her to withdraw from several tournaments. High points of the 2000 season included doubles victories, with Venus as her partner, at both Wimbledon and the Olympic Games. The sisters won the doubles title at the Australian Open in 2001, marking their dominance in doubles at all four Grand Slam events. Having recovered in spectacular fashion from her various injuries and illnesses of the preceding years, Williams seemed unstoppable in 2002. The best players in the women's game were no match for her unparalleled strength and speed on the court. She was victorious in eight out of the eleven tournaments she entered, earning nearly $4 million in prize money. At the NASDAQ-100 Open in Miami, Florida, Williams defeated the top three players in the world, including her sister, to win the singles title. This achievement marked one of many history-making wins: she joined tennis great Steffi Graf (1969–) as the only ones to defeat the world's three best players in one tournament. Three times that year—at the French Open, Wimbledon, and the U.S. Open—Serena met Venus in the finals of a Grand Slam event, and three times she defeated her sister. After her victory at Wimbledon, Williams became the top-ranked women's tennis player in the world. During the U.S. Open Serena wore a one-piece black outfit made by Puma, a company she had signed a hefty endorsement deal with a few years earliers. The outfit—so different from the traditional white tennis dress—attracted nearly as much attention as Williams's playing. The real story of 2002, however, was that she was one of just seven women in the history of the game to win three consecutive Grand Slam titles in a single year. Serena Williams holds up her championship Trophy at the 2002 U.S. Open. The following year, 2003, Williams completed her sweep of Grand Slam events, beating her sister to win the singles title at the Australian Open. She won a number of other significant singles titles that year, including a second consecutive win at Wimbledon. She held on to her number-one ranking for over a year, until August of 2003. Williams's extraordinary success was recognized by the cable sports network ESPN during its annual ESPY awards program: she won the ESPY for best female tennis player and best female athlete. The year proved a difficult one regarding injuries, but such problems seemed insignificant compared to the tragedy Williams and her family endured in September of 2003: her sister, Yetunde Price, was killed in Los Angeles, a victim of a random act of violence. For much of 2004, Williams dealt with a recurring knee injury. She won the NASDAQ-100 Open in Miami for the third year in a row, but at many other tournaments of the year she was either defeated or had to withdraw due to injury. Her pursuits outside of tennis began taking up more of her time as well, particularly her efforts to become an actress. Beginning in 2002, Williams started earning guest roles on various television shows, including My Wife and Kids, Showtime's Street Time, and Law and Order. She also scored a part in Hair Show, a feature film completed in 2004. Williams told Alex Tresniowski of People magazine that she's a natural-born performer: "If I hadn't played tennis, I was destined to be an actress. I'm a complete drama queen." Williams has, in spite of her tremendous wealth and success, remained down to earth. She is a devout Jehovah's Witness, a Christian denomination that involves intensive Bible study and the preaching of biblical teachings to others. While some have criticized the Williams sisters for what they perceive to be arrogance and unfriendliness, Serena and Venus have also developed a reputation for avoiding petty exchanges of insults among tennis players. As world-famous tennis stars, they have been the subject of numerous rumors and negative reports in the media, but they try to ignore such press. In an interview with Oprah Winfrey for O, The Oprah Magazine, Serena reported that she doesn't care what others think of her—"as long as my family knows who I am. And I know that a lie can't live forever. Most of the lies people tell about us are eventually washed away, so they don't bother me." Williams attributes her levelheadedness to her strong family relationships and spiritual background. "My mom raised us to be strong women," she told Winfrey. "We were taught that things like peer pressure didn't exist for us." Leand, Andrea. "Smash Sisters." Sports Illustrated for Kids (August 1998): p. 34. Toure. "The Queen." Sports Illustrated Women (December 1, 2002): p. 62. Tresniowski, Alex. "Second Serve." People (June 28, 2004): p. 136. Winfrey, Oprah. "Oprah Talks to Venus and Serena Williams." O, The Oprah Magazine (March 2003): p. 186. Serena Williams. http://www.serenawilliams.com/ (accessed on August 17, 2004). "Serena Williams." ESPN.com. http://espn.go.com/tennis/s/wta/profiles/swilliams.html (accessed on August 17, 2004). "Serena Williams." WTA Tour. http://www.wtatour.com/players/playerprofiles/PlayerBio.asp?ID=&EntityID=1&CustomerID=0&OrderID=0&ReturnURL=/&PlayerID=230234 (accessed on August 24, 2004). Many years ago, one of the tennis reporters reported that Serena had a daughter when she was very young. I haven't heard any more about it and wondered if this was mis-information. Does she or doesn't she have a daughter.